BOSTON–The John F. Kennedy Presidential Library and Museum announced today that it has declassified and made available for research presidential recordings of two meetings between President Kennedy and three of the US Senate’s most influential ranking members: Senators Mike Mansfield, Everett Dirksen and Henry “Scoop” Jackson. The subject of these meetings was the upcoming Senate debate and vote on the Limited Nuclear Test Ban Treaty. 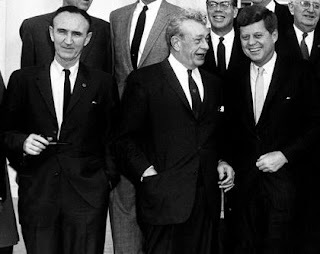 Although the Treaty was signed in Moscow on August 5, 1963, by U.S. Secretary Dean Rusk, Soviet Foreign Minister Andrei Gromyko, and British Foreign Secretary Lord Home, the Treaty awaited approval by the US Senate. The Senate debate on the Treaty was expected to be intense. From August until late September, President Kennedy had the difficult task of easing the fears of the American public and of a divided Senate to gain the necessary support for the Nuclear Test Ban Treaty. The two meetings released today offer an exceptional examination into President Kennedy’s political, public relations and decision-making processes as he attempts to convince those “on the fence” to vote for the Treaty and also to finesse those already on board. The three men proceeded to review the letter point by point. The President agrees and the verbatim letter was sent by the President to Senators Mansfield and Dirksen the following day. [Click here for PDF of letter]. The letter of assurances “from” the President helped influence many of the undecided Senators to later cast a vote in the Treaty’s favor. It was a successfully planned public relations move. Senator Jackson and the President deliberate not only the Test Ban Treaty but also South Vietnam in some detail. President Kennedy: Hell of a place to intervene. After the back and forth, Jackson leaves the meeting saying that he will decide the following day how he will vote on the Treaty. In the end, he voted for ratification. The Senate approved the Limited Nuclear Test Ban on September 23, 1963, by an 80-19 margin. President Kennedy signed the ratified Treaty on October 7, 1963. Today’s complete release incorporates the two nuclear test ban discussions from tape number 109. This release totals 54 minutes of recordings of which 1:27 remain classified. Approximately 30 hours of meeting tapes remain to be reviewed for declassification prior to release. Processing of the presidential recordings will continue to be conducted in the chronological order of the tapes. The first items from the presidential recordings were opened to public research in June of 1983. Over the past 20 years, the Library staff has reviewed and opened all of the telephone conversations and a large portion of the meeting tapes. The latter are predominantly meetings with President Kennedy in either the Oval Office or the Cabinet Room. While the recordings were deliberate in the sense that it required manual operation to start and stop the recording, it was not, based on the material recorded, used with daily regularity nor was there a set pattern for its operation. The tapes represent raw historical material. The sound quality of the recordings varies widely. Although most of the recorded conversation is understandable, the tapes include passages of extremely poor sound quality with considerable background noise and periods where the identity of the speakers is unclear. Kennedy Library Archivist Maura Porter is available to answer questions from the media concerning this newly released tape or the Kennedy Library Presidential tapes in general. She can be reached through Rachel Day, Director of Communications. Today’s release of White House meetings is available for research use in the Library’s Research Room. The hours of operation are Monday – Friday from 8:30 am - 4:30 pm and appointments may be made by calling (617) 514-1629. The recordings and finding guide are available for purchase at the John F. Kennedy Library, Columbia Point, Boston, MA 02125, or by calling the Audiovisual Department (617) 514-1622. Members of the media are cautioned against making historical conclusions based on the sound clips and transcript alone. They are provided as a professional courtesy to facilitate the reporting of the release of these presidential recordings. The John F. Kennedy Presidential Library and Museum is a presidential library administered by the National Archives and Records Administration and supported, in part, by the John F. Kennedy Library Foundation, a non-profit organization. The Kennedy Presidential Library and the Kennedy Library Foundation seek to promote, through educational and community programs, a greater appreciation and understanding of American politics, history, and culture, the process of governing and the importance of public service. More information is available at www.jfklibrary.org.